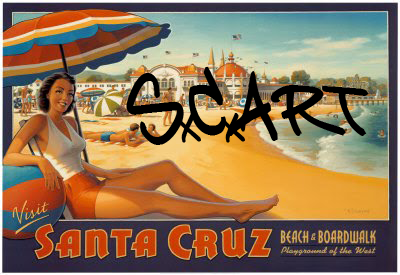 Santa Cruz Art: Hello folks, just passing thru Cruz for a week on my way to a festival. I've been downtown doing some painting. Stop by and say hi. I also play flute but on Saturday it broke. I took it to the shop and they said repairs would be over $300. If anyone out there knows of any flutes out there I can purchase or trade for art let me know. I'm also looking for paint if you have any extra. :) thanks. Hello folks, just passing thru Cruz for a week on my way to a festival. I've been downtown doing some painting. Stop by and say hi. I also play flute but on Saturday it broke. I took it to the shop and they said repairs would be over $300. If anyone out there knows of any flutes out there I can purchase or trade for art let me know. I'm also looking for paint if you have any extra. :) thanks.